Yamashita Tatsuro has produced many artists and a few of them are quite unexpected. The one I bring up here is a band called Cools Rockabilly Club. My brother, sister and one of my cousins are kinds of delinquents when I was growing up. However, I was somehow not so, just a coward and chicken, but I was just amused with the disturbances that happened around me. Even so I was really influenced by them about my taste in music. I could hum most of the songs by CAROL or Yazawa Eikichi when I was an elementary school boy. The band I loved best of all them was Cools. I liked them when Tachi Hiroshi was the leader of it but I’d rather like their tunes after he left and they changed the name to Cools Rockabilly Club. I used to play their songs on an old radio cassette even when I took a bath. There was an album that had a different atmosphere among theirs. 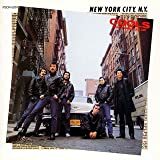 That was “NEW YORK CITY, N.Y” （1978）. It sounded sophisticated even for a boy. This album was recorded in New York actually. COOLS LOVE CHANCE ニューヨーク・シティー N.Y. It was not until after so many years had passed since I didn’t listen to their music any more that I knew this album was produced by Yamashita Tatsuro. In this album, the songs and words were written by members, mainly by James Fujiki, as before, and Yamashita Tatsuro was credited as a sound creative producer. Actually he went to New York ahead of the members and arranged everything for them like the studio to use, the musicians to work with, and so on. His debut album “CIRCUS TOWN”（1976）was recorded in New York and Los Angeles so he could perhaps make use of his connections, I guess. This combination might seem a little bit strange but Yamashita Tatsuro has a deep knowledge of doo-wop or soft rock, and Cools played mainly oldies so there could have been something they could share. I also often see articles that say Tatsuro thought highly of James Fujiki’s talent. I’m sure James Fujiki’s songs are really catchy so I think his works should be evaluated more highly. I wanted to listen to this album for the first time in many years so I bought it on Amazon. I listened to it from the different standpoints, but I found it really good as I had felt before.